“I am a quarter Armenian but it’s the best part of me.” I first said this in Singapore where I was welcomed by the Armenians in Asia as they continued their historic tour with His Holiness Karekin II, the Supreme Patriarch and Catholicos of All Armenians. If you are unfamiliar with His title, He is to the Armenian faith what the Pope is to Catholicism. Why was I on this tour? About a year ago I received an emotional phone call from my ‘cousin’ Rachel in Rangoon. Cousin is in quotation marks because by family tree rules she is considered to be my third cousin, once removed. By the rules of our friendship she is much more than that. I met her during my first visit to Burma in January, 2013, at the Armenian Church in Rangoon. She, her father Richard and Mr. Basil Martin were the sole local parishioners, although occasionally the congregation swelled to eight or nine if visiting tourists or NGO members came. Richard Minus (Yay! another Minus) had been the Warden for many years and took an active part in the service, ringing the bells, while Rachel was the sole voice of the choir, and a very beautiful one. At that time I met what I thought was the current priest, John Felix. He invited me to read from the lectern. He invited everyone up to take the sacrament, whether they were baptised in the Christian faith or not. He did not speak Armenian, nor was ordained in the Armenian church. His sole claim to his job seemed to be that his father, an ordained Anglican priest had held the position for more than 20 years. When he died in 2011, his son stepped in, claiming to have the same qualifications. He took great pains to tell me who he had been ordained by and where. No clergyman I have ever met has felt the need to do this. I asked to see the register of Births, Marriages and Deaths. It was stolen along with the candlesticks, he said. Any other documents about the church? Yes but you can’t see them. Why not? You cannot step up close to the altar where they are stored in a safe as you are not ordained. Well, can you bring them out to me? Not possible, he said with much smarmy grinning. He was obsequious to the point of being another Uriah Heep. But, I always think the best of people and in this church my grandparents were married, my grandfather had his funeral rites and my great-aunts’ trek was remembered in a plaque. So, I gave him $200 for the church and $25 for himself. In case you think that is a bit cheap, consider that the average monthly wage in Burma is $40. He took me to see Mr. Basil Martin, the last full Armenian to worship in the church, although failing health had made his visits few of late. Mr. Martin lived in the splendid colonial house where he was born, hardly updated except for a modern bathroom. The kitchen was a separate building connected to the house by a covered walkway. Inside was the huge brick cooking range fired by wood with holes in the top to accommodate the ‘degchis’ or cooking pots. A single cold tap fed by a garden hose sufficed for water. The modern fridge was inside the house. He was looked after by Rita, the Chinese housekeeper and her daughter. I was allowed to see inside the house. You could see it had once been an elegant home, but now it was in a squalid state. I was most shocked by the state of Mr. Martin’s bedroom. His mattress was on the floor, covered by a dirty cloth tent with ragged mosquito netting panels. The room was dusty with the accumulation of months, not days. There was no air conditioning, all the windows were shut tight and looked like they had been that way for years. The house sat on two acres in the rich embassy neighbourhood of Rangoon. He rented out the top half to a doctor and his family. He was descended from the prosperous family of A.C. Martin, who built many of the beautiful colonial buildings you see today. How had his life and the life of the church come to this? Rachel’s call revealed all. Mr. Martin died in May, a few months after our meeting. He had been Chairman of the trustees, with Richard as Warden. There was only the two of them and now one was dead. John Felix had declared he was head of the trustees now and he would sell the church grounds off to the highest bidder. Contractors were abuzz with excitement. Rachel asked me tearfully if he could do this. Of course not! Was the man insane? Church property belongs to the church, not some individual. How dare he mislead me and try to sell this property? My blood was up. That phone call started me researching everything I could about the church. Rachel contacted the Armenians in Asia group and we both communicated with Pierre Hennes of Singapore. They were shocked by what was happening and started the ball rolling which, a year later, culminated in the first visit ever to Rangoon by the head of the Armenian Church. His Holiness, His Grace the Archbishop, attendant priests and the worldwide group of influential Armenians travelling with them throughout His SE Asian tour attended the installation of a blue historical plaque, only the third awarded by the Yangon Heritage Trust. This trust, headed by Thant Myint U, is doing wonderful work trying to preserve the colonial buildings in Rangoon. Laetitia Millois, of YHT, and I had worked together on three storyboards inside the church, giving visitors a chance to understand not just the history of the church but the importance of Armenians to the development of Burma and Rangoon. On Saturday, October 4th, the church was packed for the liturgy to be performed by His Holiness Karekin II. This was the culmination of a year’s worth of emails, phone calls, research at the British Library, shock at Felix’s manoeuvres, times when we felt like giving up. We knew, however, that the experienced and influential Armenians in Asia group had everything in hand. The deceitful John Felix was not going to mis-represent himself as a priest and take over. He was not going to sell off my ancestors’ heritage. I would see him in Hell before I let that happen. A packed church on Oct. 4, 2014. Tina Minus talks to Winsome Vertannes in the centre. Winsome’s mother waits for the service to start. performing Divine Liturgies and sacraments. Mr.
the Armenian Church and nation. Well, I was in church. You can’t jump up and scream “Yes,” while pumping your fist in the air. But as I looked around at the beaming smiles of the congregation I knew they all felt like doing just that. Another cousin, Tina Minus, leaned forward and said this must be translated for the Burmese newspapers. I hope it was. The press were there, security were there, but where were Rachel and Richard? For that matter, Felix wasn’t there, either. They were all together with the lawyers. Felix had been exposed and they wanted answers.They had discovered proof he was never ordained as a priest, merely a deacon. 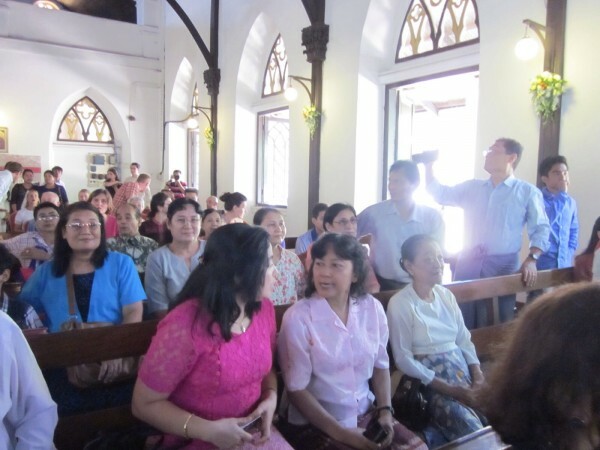 He was de-frocked of this title while in Thailand, for misappropriation of funds, so was completely without any qualifications when he came to the church in Rangoon. He deceived Mr. Martin, playing on his father’s reputation, manipulating a frail and trusting old man. By church law, he desecrated the altar every time he used it, Sunday after Sunday for more than three years. The lawyers wanted him to return the keys to the church. He refused. They issued him an ultimatum: if he did not return the keys by 12:30 he would be denounced at the service. He could have one month to quit the shack he lived in, rent free, on the church property. He talked vaguely of having papers but funnily enough could not produce them. So, the denunciation was made. The BBC who were working on an article and had interviewed me, for background history, and Rachel, for what the church meant to her, immediately took up the story. You can see it here. Look at Felix’s body language and come to your own conclusions. A couple of days later I visited the church. Felix was still there. I asked what on earth he was doing there? He retreated to his shack and shut the door in my face. I talked at him through the keyhole telling him I knew he was de-frocked and had no right to be there. He threatened me with the police. 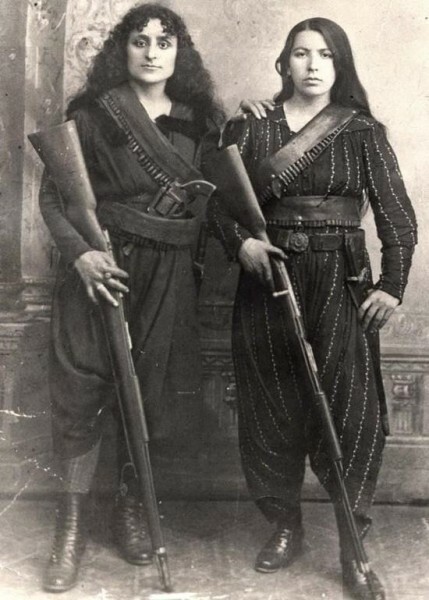 The cheek of the man knows no bounds, but this feisty one quarter Armenian lady will not put up with it, and neither will the Armenian community worldwide. 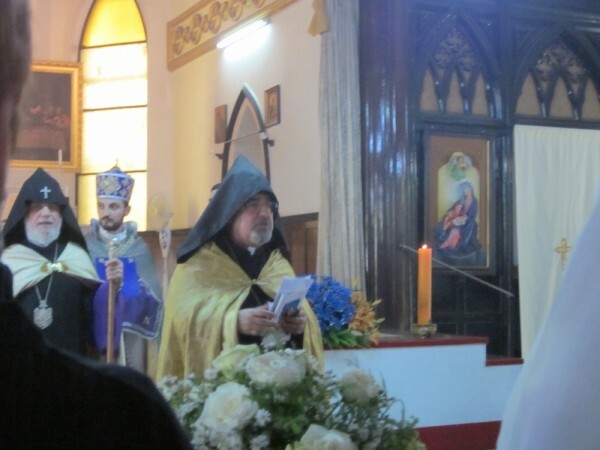 I will go to the church this Sunday, Oct. 12th along with the Minus clan, to enjoy the service conducted by the Very Reverend Father Zaven Yazichyan. He assisted at the re-consecration and will be one of three priests from Calcutta who will come every Sunday, to serve the new congregation in a newly cleansed church. It is a re-birth for the little church that was consecrated in 1863 and the result of the innate feistiness of Armenians all over the world. 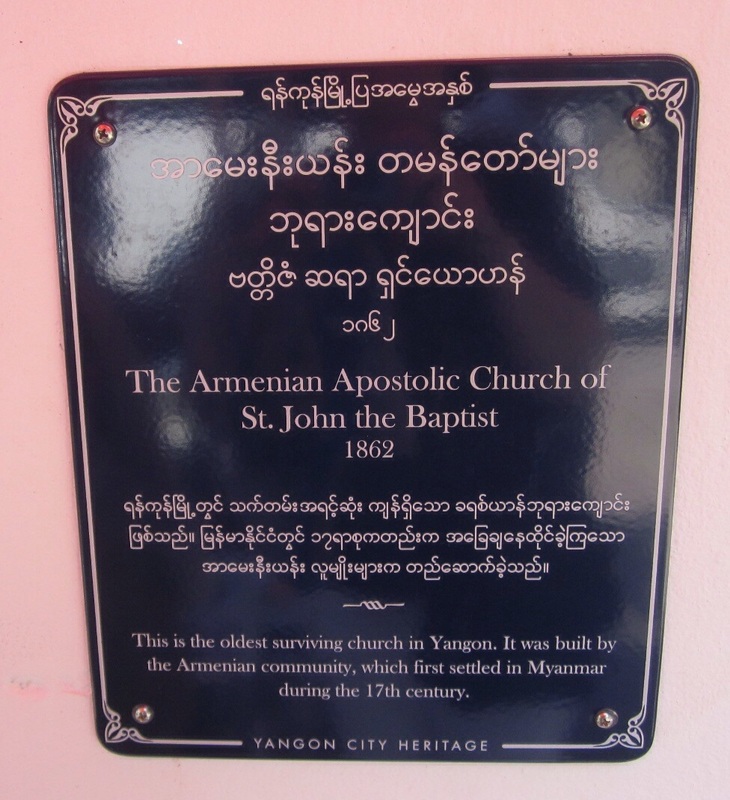 This entry was posted in Armenian Church, Armenians in Burma and tagged Armenian Apostolic Church of St. John the Baptist, Armenian Church Yangon, His Holiness Karekin II, John Felix, Preacher refuses to give up keys to Armenian Church in Yangon, Yangon Heritage Trust. Bookmark the permalink. With a tiny congregation, a confused elderly man as chairman of the trustees and Burma being visited by few Westerners when he first came, he thought could. He had another think coming, as my granny used to say. This blog post was written in Rangoon yesterday, while I was sleep deprived and battling with the slow internet, constant difficulty in uploading images and occasional freezing of the page resulting in loss of data. So it is with many apologies that I am late in thanking everyone who has helped me on this journey. Liz Chater who has been holding my hand via the Internet at 4:30 am Rangoon time and chivvying me along, notifying me when news appeared and encouraging me to keep at it when I was ready to give up. Laetitia Millois who encouraged me at lunch this afternoon to keep writing and has been a wonderful host and personal tour guide, as well as introducing me to the Myanmar Book Centre and the National Archives. Enough material there to keep me in blog posts till I die. Pierre Hennes, Gevorg Sargsyan, Armen Budagyan, Henri Arslanian, Armen Arslanian, Hagop Didizian, Armenians in Asia and everyone on the tour who welcomed me, the “just a housewife with her nose in a book.” Most of all, I thank my understanding husband who urged me to join the tour to Singapore and Rangoon, smoothed away my self-doubts and gamely said he would be fine for food while I was gone for three and a half weeks. Thank you, thank you, I could not have done it without all of you. Thanks for telling us all about this challenge.Please keep up the courage and the perseverance and keep the world informed ! SHARMAN YOU ARE SUCH A STRONG DETERMINED AND BRAVE LADY. I REALLY ADMIRE YOUR WORK FOR ARMENIAN CHURCH IN YANGON. ALSO MY THANKS GOES TO RACHEL AND RICHARD MINUS. Thank you for bringing this article to our attention. Very interesting. Congratulations on your achievement on saving this precious church. Thanks for this very informative piece. Is Liz Chater any relation to THE Chater who established Hong Kong’s commerce and financial world? I am an old colleague of Basil Martin OBE he was the agent for my company for many years. I spent 15 months in Burma in 1981/82 building a power station at Prome plus I visited several times over the Yeats to 1991. I also visited him with his wife and family Perth WA around 1992 and have always wondered what became of him. Although his wife and family had moved to Australia he said he would remain and die in Burma, which he obviously did. Can you me when he passed it not clear whether it was May 2013 or 14. Is there anything else you can tell me about him or of anyone else who could. Mr. Basil Martin passed away in 2013 which then kicked off the events surrounding the attempted church takeover by the false priest. It must have been fascinating to be in Burma in the 1980’s. I will email you.